“So how do you feel?” Grab a cup of coffee and I’ll share my answer. In less than 24 hours, anyone who chooses can open a cover and read a copy of my soul. 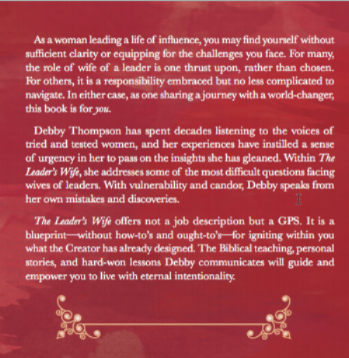 Friday, May 11, 2018 The Leader’s Wife, Living With Eternal Intentionality launches. But, the rocky road from then until now has been a road without a map, a road without a GPS. At least for me, that is. Thankfully, the journey began with crystal clear guidance from The Lord: “God, if You want me to write a book, I must know this is definitely from You. I do not want any part of lighting my own fires (Isaiah 50:11 NLT). His Word contained my answer, The things I have said to you, put in a book (Jeremiah 30:1). “While we are waiting for a publisher, you need to be blogging.” (Les Stobbe, my sage-of-an-agent) I am glad I obeyed. Now, while waiting for the first copies to be delivered to my front door, I bow in worship of the One Who brought this book to pass; the only One Who deserves the praise. Not to us oh Lord, not to us, but to You be all the glory (Psalm 115:1). So, how do I feel? I am overwhelmed with gratitude, I am weak with humility, and I am silly with excitement. It seems as though I am standing under a waterfall of God’s love and grace. In a supernatural way, I am lost in wonder, love, and praise. It is true: A longing fulfilled is sweet to the soul (Proverbs 13:19). Oh God, may this be a book with a mission! Older PostWhich Way Do I Go?